James Young was born in Grosse Point, Michigan, in 1929. As a boy, he lived in England and witnessed the Battle of Britain first-hand. He enlisted in the U.S. Air Force on May 22, 1948, and served in the Berlin Airlift. Young was commissioned on September 11, 1953, and went through pilot training. He was trained in fighter and reconnaissance aircraft and he began flying combat missions in Southeast Asia with the 20th Tactical Reconnaissance Squadron of the 460th Tactical Reconnaissance Wing out of Tan Son Nhut AB, Republic of Vietnam, in early 1966. While flying his 74th combat mission, Young was forced to eject from his stricken RF-101 Voodoo over North Vietnam on July 6, 1966. After spending 2,412 days in captivity, he was released during Operation Homecoming on February 12, 1973. Col Young retired from the Air Force on January 31, 1984. He and his wife Anneliese had three daughters together-Rebecca, Carrie, and Denise. James Young died on November 18, 2006. 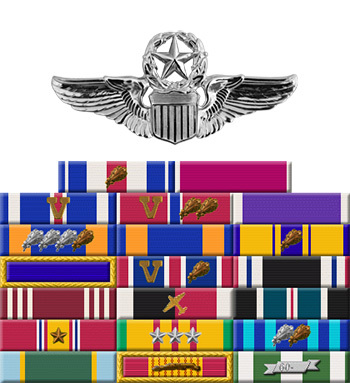 Major James F. Young distinguished himself by gallantry in connection with military operations against an opposing armed force in North Vietnam on 22 May 1966. 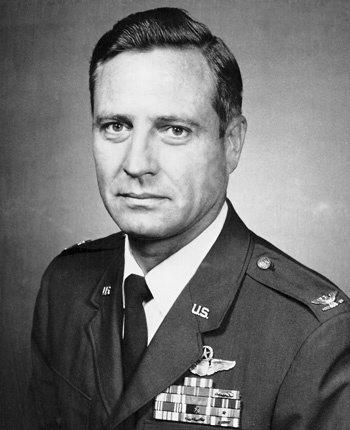 On that date, Major Young flew a single-seat, unarmed RF-101 reconnaissance aircraft deep into hostile territory against one of the most formidable defense systems ever faced by air crews. Despite battle damage received enroute to his target, Major Young, realizing the importance of his mission, resolutely pressed on. Reaching his target area, he faced an even greater danger from intense flak and missiles in that he had to fly a straight and level course to obtain target photography. Major Young's missile warning scope blazed with indications of missile lock-on as he proceeded on his photo run; however, he determinedly held his course and successfully completed a vital reconnaissance mission of great significance to national security. By his gallantry and devotion to duty, Major Young has reflected great credit upon himself and the United States Air Force.